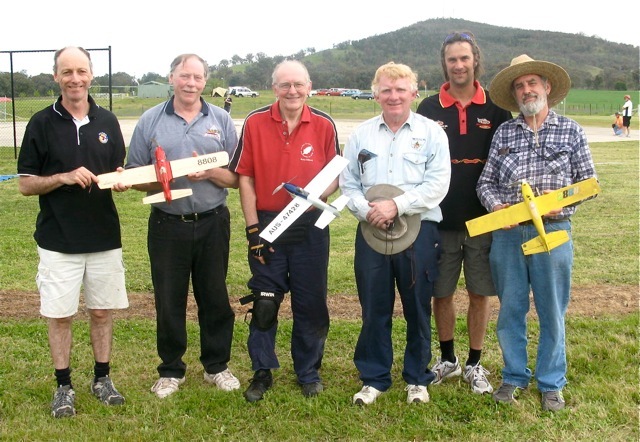 F2A speed, F2C, Classic B, Vintage A, Classic FAI & 27 Goodyear team racing. The lovely weather continued for Classic B and it was late Saturday afternoon before the screaming .25 engines shattered the serenity of a tranquil Albury countryside. However, the control line modellers loved this ‘beautiful noise’ and seven teams proceeded with practice to get ready for the heats. The first heat saw John Hallowell and Murray Wilson cross the line first in a 3.02.03 with the OS FX 25 Streak ahead of Steve Rothwell and Chris Sculley’s OS FX Rocket on 3.13.10. Chris and Steve had some battery issues that slowed them down. Not far behind were Harry Bailey and Ken Hunting with a 3.21.75. John and Murray decided to sit on their time with the expectation that it was unlikely 3 teams would be faster. Probably wouldn’t be game to do that at the upcoming Nats! Harry and Ken improved to 3.13.37 in round two. When switching roles with Ken flying his model, they could not get it on the pace and two four minute plus times were posted. Paul Stein had Richard Justic flying his super Rocket, which now has FX grunt up front. The boys were wound up and were going to take advantage of a 2 up heat against Mark Ellins who was holding the handle for Jim Ray. They sure did… and recorded a very fast 2.54.53, the second fastest Classic B heat of all time. Only Rothwell/Sculley’s 2.52.54 in Albury at the same time last year is quicker. The third fastest time is 2.55.75 by Hallowell/M.Wilson with the Irvine Rocket. This was on grass at the 2012 Vic State Champs. Mark and Jim finished on 3.27.60 with the OS25FX Crescendo. They had the starting sorted by the second round and looked a real chance to make the final but just missed out when the watch was stopped on 3.08.47. Ryan Leknys and Steve Walton couldn’t get rid of the gremlins in the gear and did not post a time. It was time for the final. The race promised to be a beauty with near perfect conditions in the circle. All were swiftly away with Justic/Stein and Hallowell/Wilson neck and neck. Once again, the OS 25 FX Rocket of Rothwell/Sculley was having issues and spent too much time on the ground. Despite their impressive airspeed, they could only manage third. When the dust settled, it was a narrow win for John and Murray with Andrew Nugent on battery in what was the third fastest final time ever in Classic B, a 5.54.83. They also have a 5.53.12, the second fastest time, but it is Paul and Fitz who hold the current record of 5.49.40 on grass at the 2010 Vic State Champs. There are a lot of Classic B teams aiming to break that time. Not long now until Sunday morning, December 29th where we will get the chance to line up again for more extra close Classic B racing at the Albury Nats. Can’t wait! After F2A and F2C had finished their early rounds, it was Vintage A that was to start the ball rolling for the other events. Six teams entered and that made it easy to run 3 up heats. The first race saw Andrew Nugent and John Hallowell post an FTD 3.23.44 for the 80 lap heat. Steve Rothwell and Chris Sculley stopped on 77 laps, but not to worry, they had a second chance and did not waste it with 3.27 .76 second round which allowed them to sneak into the final. And the 2010 Dalby National Champs were not going to waste the opportunity! Andy Kerr and Richard Justic had the old faithful yellow Voodoo wound up and running great with an excellent tune. Their time of 3.27.25 was good enough for second segment choice in the final. Harry Bailey and Ken Hunting again doubled up on the entries but a fast time was to prove elusive on the day. It was photographic and time keeping duties for the 160 lap final for this pair. As you would expect, all three R250’s were away with just a flick of the propeller. Speed was fairly even between the two Voodoo 5 racers of Rothwell/Sculley and Justic/Kerr, but alas, Hallowell/Nugent were under compressed and were falling behind. Otherwise it would have been a real photo finish. So Steve and Chris took the chocolates by about one lap from Richard and Andy. They now again have the taste for Vintage A success. What a great Nats it is going to be! For the second time this year, it was 27 Goodyear time in Albury. Again, there was strong support for this popular new racing class. The good news for enthusiasts is that 27 Goodyear will be run as a demonstration event at the upcoming Albury Nationals. It is scheduled for Thursday, January 2nd and will most likely be flown on grass at the Twin Cities club after 1/2A Combat and Junior 2.5 Rat. It is hoped that some more of the NSW teams that actually got this class up and running will make the effort to turn up and help show the rest of Australia what 27 Goodyear is all about. Six teams rolled out their lines and began to check settings against their stopwatches. Richard Justic and Ryan Leknys were struggling to get the Cox Conquest/Argander combo above the 27 second line. Most of the others were just over the limit and not flying in fear of the Speed Police requesting an extra pit stop. Apart from racing at a very easy to fly speed, one of the attractions of this 27 Goodyear class is the variety of models and engines. There was a diesel Cox Conquest, R250, Fora Jnr, Oliver Mk4 and even a couple of OS 15 FP’s. At this stage, the diesel only rule will not be enforced, as there is a need to encourage as many teams as possible to take part now and then later at the Nats. We all know it takes time to build new models! Mr D’s, Arganders and Ol’ Blues were popular designs. Steve Rothwell and Chris Sculley have been flying this event in NSW for some time now and their experience showed. They reeled of an impressive 5.02 first round and decided to sit on that time for the second round. Graeme and Murray Wilson were in the mix with an Ollie Mk4. However, times of 6.03.28 and 5.50.38 were not quite fast enough this time. Harry Bailey and Ken Hunting again swapped models and piloting duties but their combined best time of 5.45.37 was going to leave them short of making the 200 laps final. Having got the excess speed problem almost under control, Ryan Leknys and Richard Justic proceeded to reel off a 5.19.56 (which included a penalty stop) and then a fully legal but slower 5.30.09. John Hallowell and Andrew Nugent had the bright blue R250 powered Mr D. wound up near the max. on the APC 8×6 prop. At one stage the Speed Police clocked them at 27.1. Close! In the second round they got their act together with a 5.10.75, good enough for second choice in the final. The final saw three evenly matched teams do battle in what seemed like slow motion at 27+ seconds for ten laps… that is when you compare it to F2C racers that fly faster than 17/10! Rothwell/Sculley’s Fora was doing most of the overtaking and opened up a small lead. Chris was as busy in the pits as a one armed wallpaper hanger. And it all paid off handsomely as they crossed the finish line first with daylight between them and the other placings. John and Andrew were runners up with Ryan and Rick less than a lap behind in third. All in all, some real fun racing in an event where you don’t have to fly like our World Champs stars Rob Fitzgerald or Murray Wilson. Just taking part at a nice and easy pace is all that’s required here. 27 Goodyear caters for pilots of all levels. It caters for the time honored Aussie tradition to ‘have a go’. Can’t wait to see them all in action in early January at the Albury Nats. WOW! What a great afternoon’s racing again at Albury in NSW. 7 entries enjoyed brilliant weather to fly their Classic era team racers. The Fora and Parra engines were the weapons of choice. Teams came from as far away as Perth, Adelaide, Whyalla, Sydney and Canberra to compete. Not one racing incident occurred due to the slower speeds these models are moving at. Average times in 3 up traffic are about 23 sec for 10 laps. Stand out teams were eventual winners, Murray Wilson and Mark Poshkens with Murray’s Ron Wilson designed replica model with Fora power. Murray has tinkered with this model over recent months to attain the necessary consistency to compete in this event. They combined this with F2C style ½ lap shut downs to run away with a clear win by a comfortable margin. Next stand out performer was John Hallowell’s new Parra powered Tiger model. John now has the cooling and tank working really well . This bright yellow racer was superbly pitted by Richard Justic from Canberra. It did not miss a beat in a very competitive heat. I timed this model in the final and the tune was again perfect from start to finish. John’s Tiger will be very competitive at the upcoming Nats in Albury in the New Year. Steve Walton and Ian Thompson from Perth completed two good times with their Russian design racer with a Fora up front. Mark and I had some gremlins in the system of my new Orion model with Parra power. I think there were some cabbages in the system and this gave 2010 F2C W/C Mark Ellins some challenging moments in the pit stops. But don’t worry… we will back again at the Nats to redeem ourselves and challenge for top spot on the podium. Paul Stein and Rob Fitzgerald did a nice 4.32 to make the final and eventual 2nd place with Paul’s familiar Espadon/Parra combination. Harry Bailey and Ken Hunting were kept busy swapping pitman and pilot roles and competing as 2 teams. The final was a beauty and, “hey!”… everybody finished unlike some more expensive classes. Murray’s quick half lap landings and Poshies lightning restarts helped them to 1st place in 8.44 at the end of a very competitive 200 lap final. John and Fitzy battled it out for the minor placings with only 1 sec separating them at the end. John and Ric were going for a 4 stopper with 40 lap range and just needed another lap to get the right shutdown position for pit stops in order to save precious seconds. The glide was longer than it should have been on two landings so they finished on 9.04. Paul and Fitzy, always consistent, were 2nd with 9.03. Well done to all. Especially to Graeme Wilson who was Contest Director for this race as well as most of the other events over the weekend. If you haven’t seen a Classic FAI race before then you must come along to the Nats on New Year’s Day, see some really beautiful models and enjoy some very competitive racing.